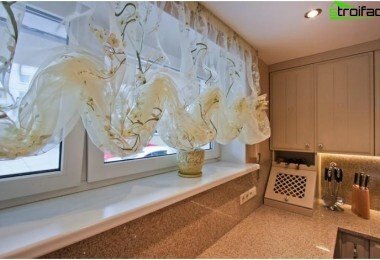 Beautiful curtains with his hands - easily! 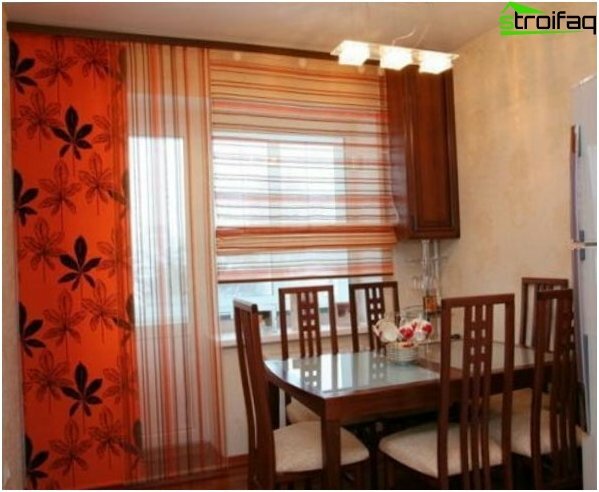 The design of the kitchen curtains should be different not onlyits beauty, but also practical: their main function - to protect the room from prying eyes, but do not interfere with the penetration of light and the implementation of the cooking process. Therefore, the traditional curtains with a variety of decorative elements here would be inappropriate. They should emphasize the shape of the window opening and beneficial to brighten all the shortcomings existing in the room. 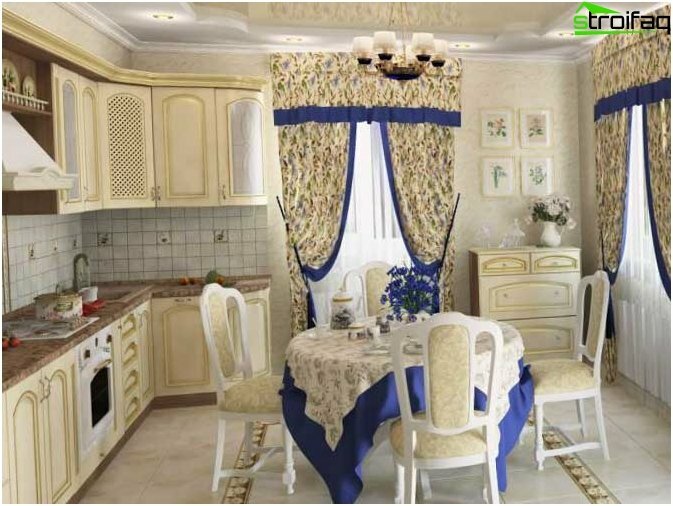 With the right mix of textile decoration, even the small kitchen will be filled with sunshine and sparkle with new colors. Curtains allow the benefit to present furniture orother decorative elements in the interior. They always draw all the attention, and taking advantage of this fact, can be beneficial to emphasize or, on the contrary to obscure the desired object. 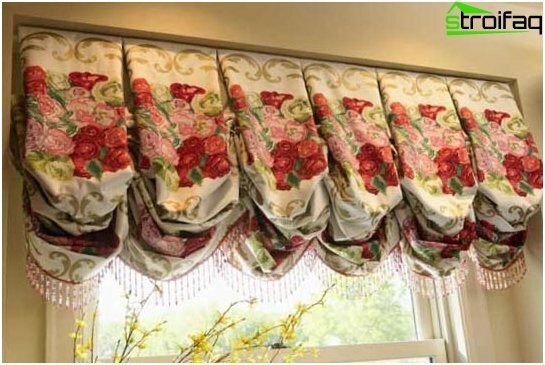 Beautiful, tasteful curtains canaffect our mood, improve performance, create an atmosphere of warmth in the kitchen, love, endless celebration of life. Here, women spend much of their time creating culinary masterpieces in the joy of the whole family. So especially important to create a space where cooking process is as comfortable as possible. If your kitchen is done in a modern style, theyou should choose the standard curtains made from synthetic, slightly shiny fabrics that are easy to care for. For such an interior is also well suited modern panel or rolled varieties: Roman curtainsJapanese and even ordinary shutters. But especially effective will look original, casually decorated draperies made of light translucent fabric: they emphasize the lightness of the kitchen and adding a light. 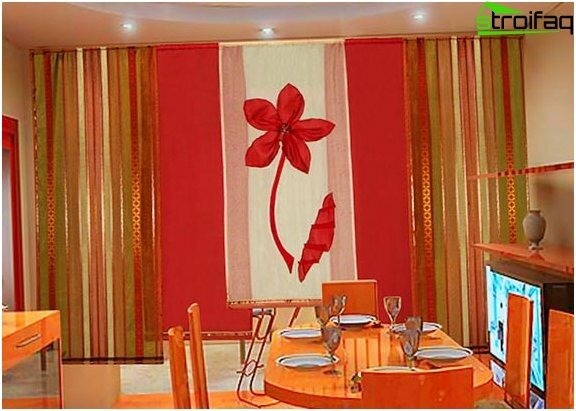 In the modern interior and stylish kitchenextravagant curtains will look a photo. As a rule, selected for printing drawing completely unexpected for the overall design of the room. For example, it may be an image of the Brooklyn Bridge on the curtains in the kitchen in the style of Provence, and the kitchen, decorated in the style of French café, effectively complement fotoshtory with views of the Eiffel Tower. The serenity and comfort, elegance of forms and objectsenvironment - these are the characteristic features of the design in a classic style. Classic curtains complete the look of the interior, expensive furniture will present profitable and bring that same flavor, which will make the atmosphere truly unforgettable. In the classical kitchen, try to avoid bright accents, rich and deep colors, which can make the situation difficult and uncomfortable. 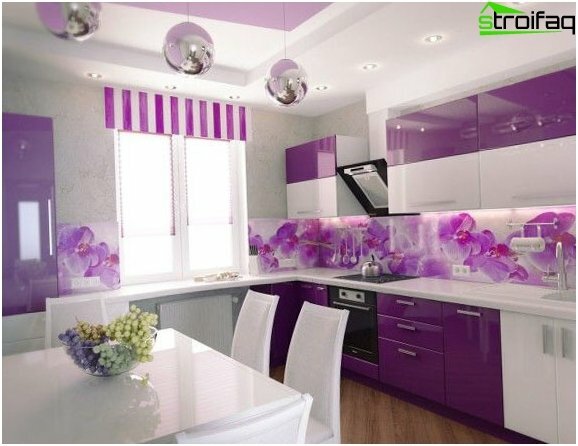 Exotic Kitchen interior with its colorfulMulticolor and emphasized luxury perfect for lovers of exquisite refinement. Mysterious eastern atmosphere perfectly complement and accentuate fotoshtory coated with these calligraphic ornamentation and the exquisite pattern. 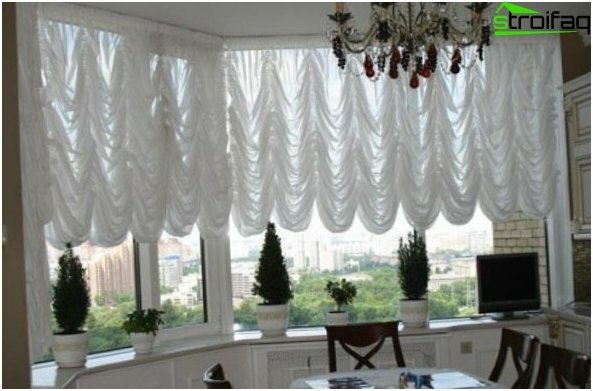 Feel free to choose a tiered curtains dzhabotami, SMAD, lambrequins, cascades. Shiny fabrics, embroidered with gold, bright colors, fringes and tassels, intricate designs arabesques - highlight all the details! Another interesting option for the kitchen in the eastern style - a veil of organza embroidered on it eastern or floral motifs. 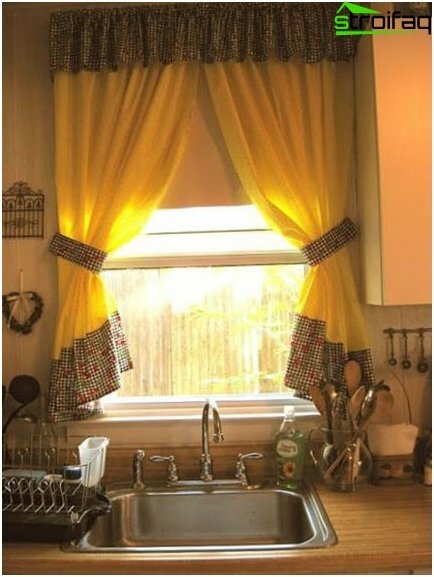 For a kitchen curtains is very easy to pick up, because here are suitablealmost any curtain! The main condition - they should not be complicated draperies, elaborate details, excessive pomp. The classic version - lightweight drapes and curtains with fine English, Austrian, Roman-themed. Curtains French style sure to append strings, loops, kuliske. Pick textiles made of light, light, translucent tissue as possible to let your colorful kitchen maximum light! Pay attention to the ledge on your kitchen does notIt was massive, otherwise lost all of the ease and simplicity of the interior in the style of Provence. It should not stand out, but only to emphasize the elegant and complement the design of the windows. Of particular importance in the kitchen with a country designTextiles: it should be a lot, and it was he who sets the whole style of the room. For a rustic interior is characterized by the use of the same fabric for the decoration of all the details: curtains, napkins, tablecloths, chair covers - they are all made of the same material, bribing the audience with their modest simplicity and creating an atmosphere of quiet comfort. 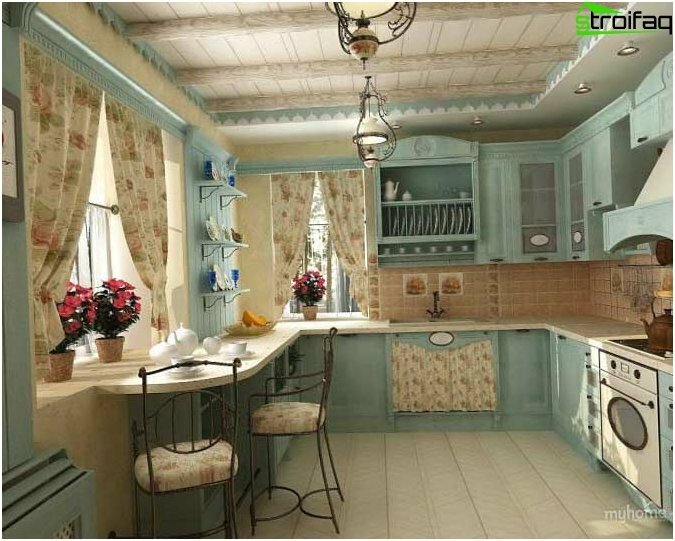 Also an excellent choice for kitchen design in the style of the country can be jalousie. 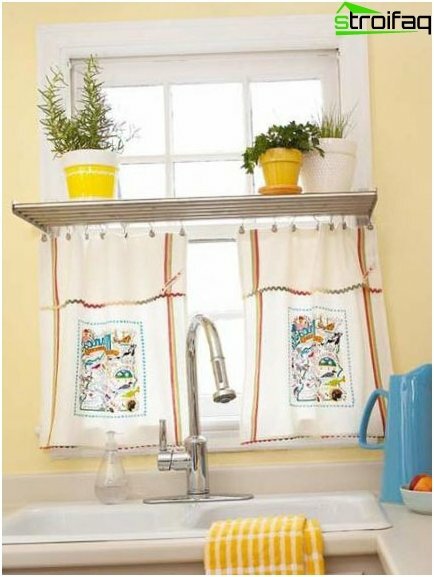 For curtains in the kitchen in country style is most oftenchoose light colors such as white or cream color fabric, but always with a picture! Specific to the country colors of curtains - it's in a strip, in a cage, flowered images of farming topics (hobbies, rustic cabins, ears, garden fruits). Among curtains shineth not; yea shades are also possible variants of red, pink, yellow, orange, red, orange, light green or pale blue flowers. In Western cuisines in the country-style window taken to issue a simple lambrequins, marquise or flounce. For example, you can make magnificent pelmet of colorful fabric in flower or in a cage. Kitchen design in hi-tech style - it is not only fashionableand original, but also practical. The stylish chrome surface will be beautifully combined with models of modern curtains or window can be left intact, not making out its textiles. A characteristic feature of this kitchen - the maximumspace, light and air. For successful implementation of this task is good use of natural light. The window can be visually expand the lung tissue using blinds or blinds that are easy to hide in the drawer, if necessary. 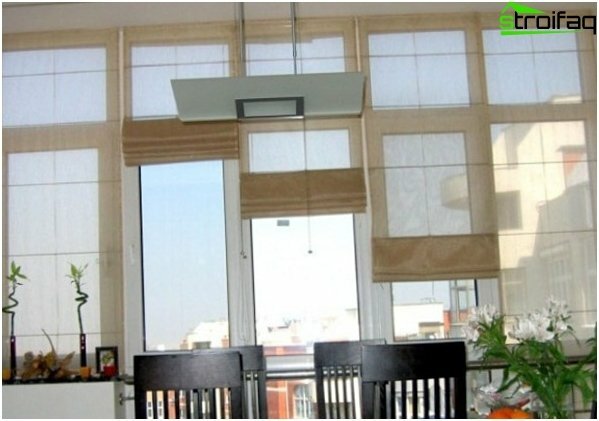 If a small window, better to choose a semi-transparent blindsWhich will be more light and make the space more free. 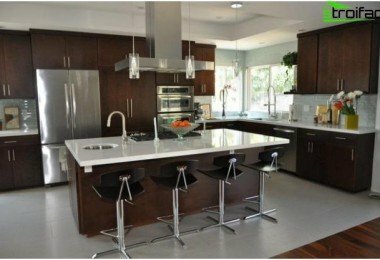 Also there are options for minimalistkitchens, where curtains juicy shades are combined in an ensemble with a contemporary and an apron of tile trim and trendy are bright accents in the interior. Color palette - gorgeous toolIncarnation in the life of any design ideas and create a dream interior. In addition, it is an indispensable tool that helps to visually expand the space, brighten up all the irregularities and to emphasize the dignity of planning. 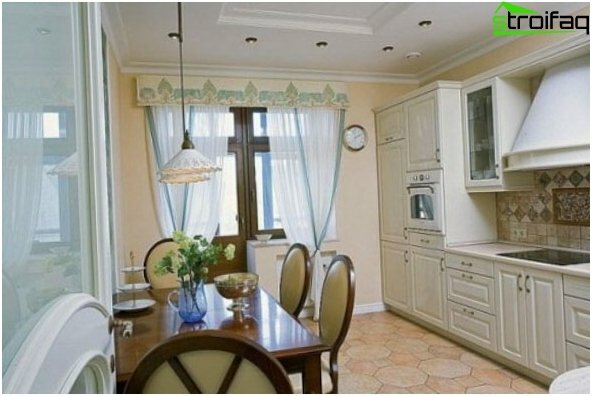 For a small kitchen is especially important, therefore, designers are advised to pick up for her bright lavender curtains, light blue, light green or pearl colors. Acceptable textile design and dark colors, but only for curtains, swags or Roman blinds to windows decor does not interfere with the penetration of light into the room. The choice of color may also be dictated by the stylepremises. 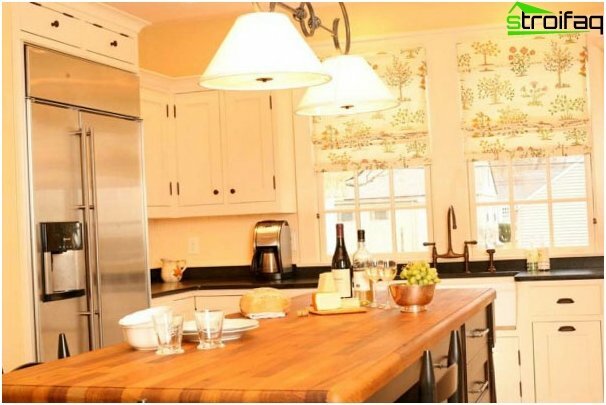 Kitchen country - it is usually light-colored fabric with pastel stripes or bright colors for high-tech - all the colors of the cold range, in a classic style permissible plain curtains or an ensemble of two or three colors. 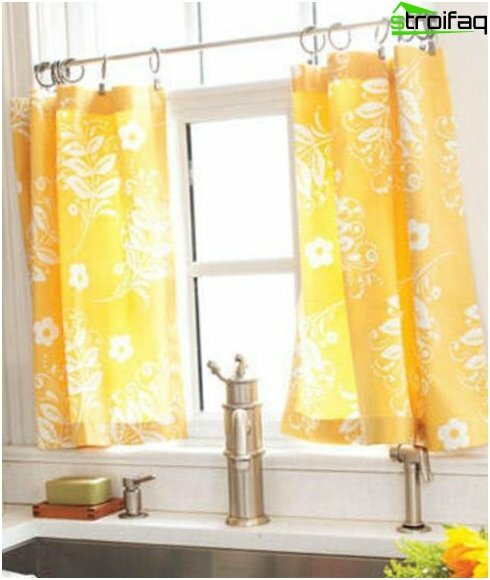 If the kitchen window overlooking the sunny side and well illuminated room - curtains can choose darker shades, but if not - curtains can be only made of light translucent fabrics. 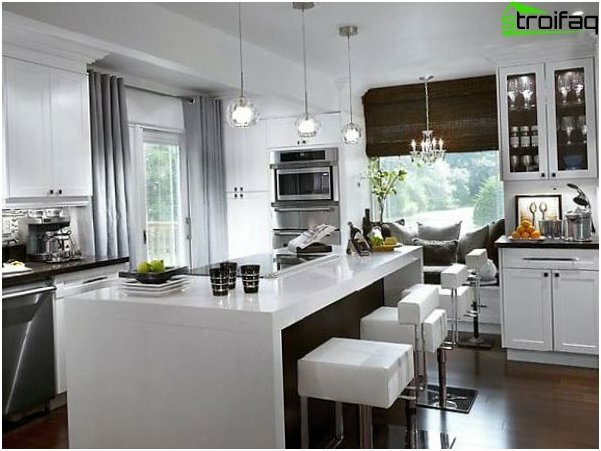 If your kitchen is made in bright colors, it is better to give preference to a simple monochrome curtains to balance the balance. You can not come up with anything extreme and simply pick up the curtains of the same color as the kitchen or facades wallpaper. 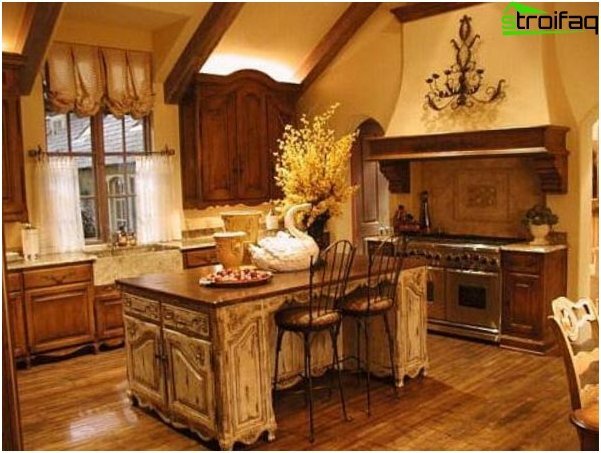 Curtains or neutral palette of soft cream colors will look equally good in the kitchen of any style. To create an additional visual effect combine shades of different colors and textures. When choosing a color palette for window decoration, also do not forget about the importance of color and its effect on the mood and the atmosphere in the room. Red shades Causes mild aggression, bloodthirstiness. 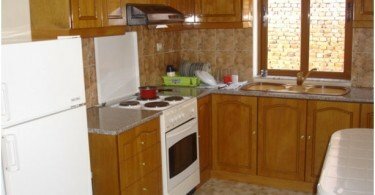 In these kitchens often overdo the food and overdoing with pepper. Acid vivid colors (salad, lemon, purple) They give cheerfulness and activity. This range in the interior contributes to the long sit-round gathering with a cup of tea. Pastel colors (pink, turquoise, pale green) Calm and peaceful owners of the apartment, stop the hustle and bustle. 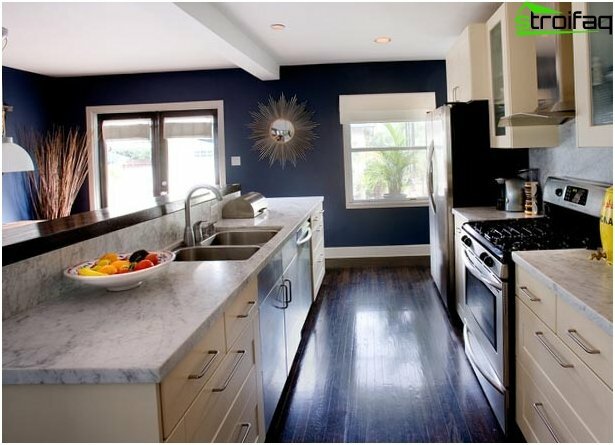 Blue color Bring to the kitchen interior freshness, will give owners harmony. This season especially popularrazvnovidnosti all kinds of gray ranging from silver, smoky "metallic" and ending with rich tones of color of wet asphalt. A wide range of different shades of gray provides many opportunities for experimentation. 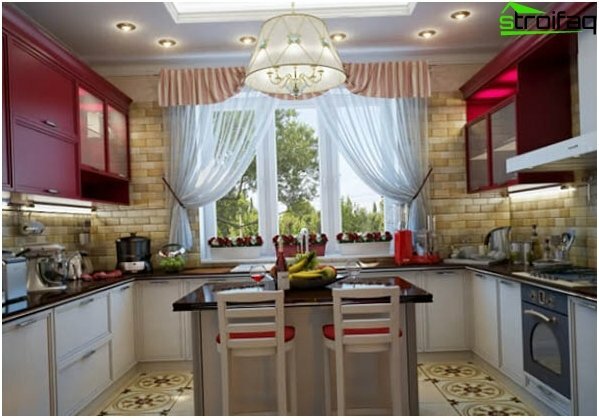 Eco-theme in the interior design, including the design of the kitchen, remains popular for several seasons. If you close this subject, feel free to choose curtains soft shades of white, beige, brown. At the peak of the popularity scale forest colors muted brown, the color of fresh greens, autumn foliage and soft moss. Supporters of the eco-movement prefer naturalness in everything: it's not just color but also texture. Another trendy option curtains of color - saturatedpurple. For this enigmatic shade is not always easy to find a suitable background, but in the interior with a dominant bright colors it will always look spectacular! Popular and unusual texturesmaterials for curtains, the use of non-standard combinations, and high-quality fabrics. Designers are advised to select materials with a strong and original texture woven cloth, richly decorated with sequins, embroidery, lurex. How much glitz and glamor! The trend of the so-called "zhatye" tissue-tissue and "chameleon", shimmering in different colors. 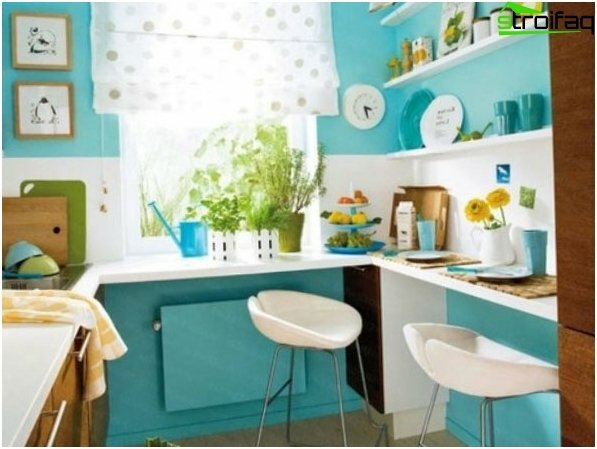 Kitchen - a great place to experiment withcolor curtains and decor! 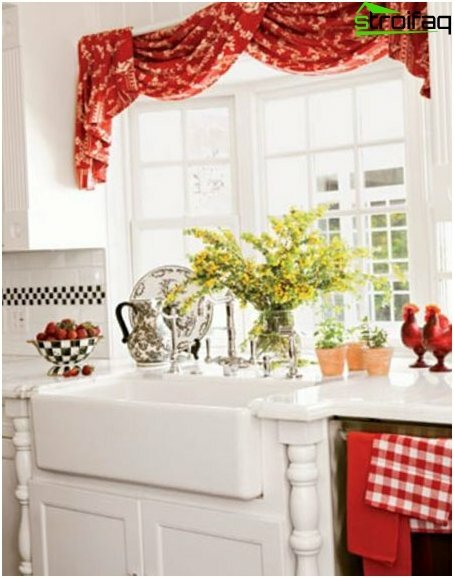 Where else can you hang curtains with bright patches of bright and unusual applications? There are equally good looking and fancy designs and trendy this season ethnic motives. According decorators, now it is the time to create and to express themselves in the design without any restrictions. So try and experiment! Home curtains function in such a narrow space -flowing the room as much sunlight. 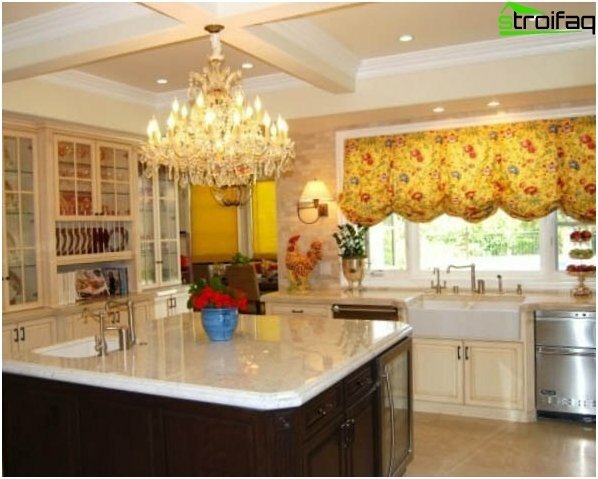 Therefore, the best choice for a small kitchen, regardless of the style are the translucent curtains plain light fabrics that will literally fill the air of the room. Forget about complex forms of pretentiousness and details: curtains with lambrequins, rich draperies - all this is certainly beautiful, but it will only pile interior. textile material has to be easy and weightless,perfect - simple solid color tulle or fabric. Say "no" major figures; allowed inconspicuous ornaments or fine patterns, but no more. Vertical stripes on the curtains will visually increase the height of ceilings. 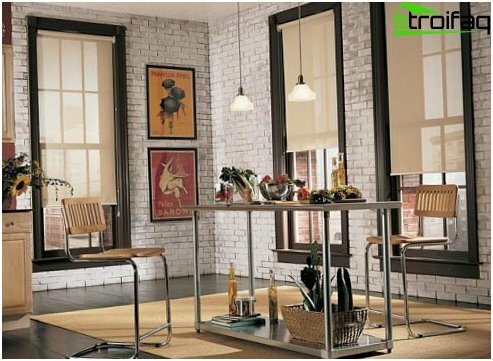 In addition to traditional models of curtains fit well as Roman, French, Austrian, roller blinds, Venetian blinds and all sorts of variations. 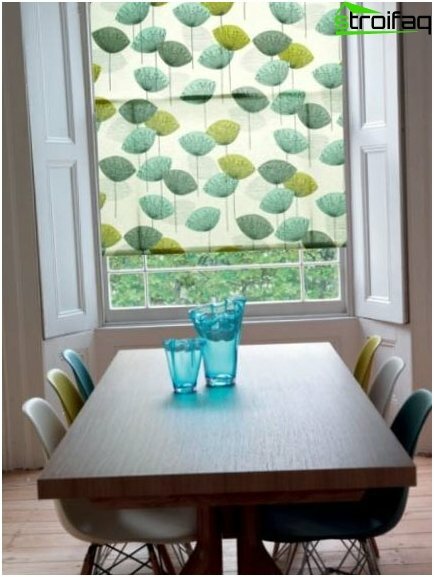 Pets blinds are coated with a photo-patterntransform any kitchen, as well as give its interior depth and expressiveness. 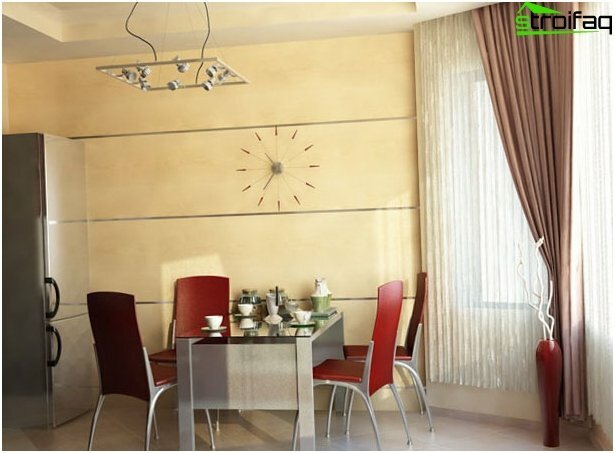 Lace blinds will look great in a classic interior, and for ethnic cuisine is best suited, for example, bamboo blinds. If the window is very small, you can visually enlarge it, hanging curtains, which are wider than the opening itself. 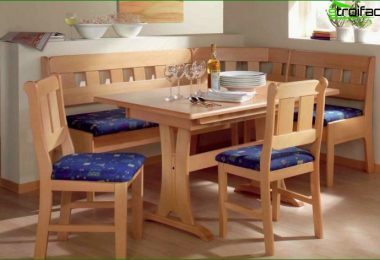 If your kitchen has balconyThen with this you can be congratulated - this is a great addition to a kitchen space that can be arranged as a cozy sitting area or used to store supplies. 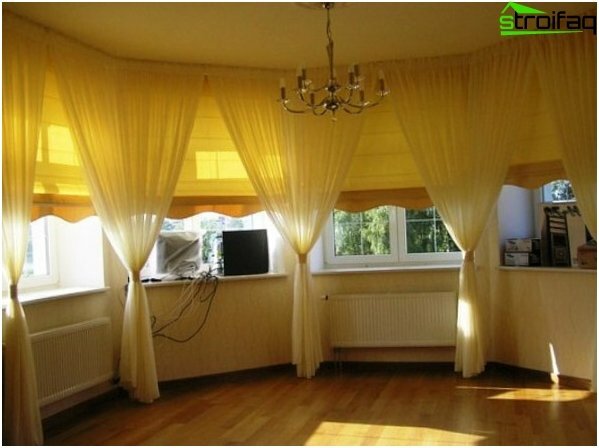 It is necessary to select those curtains that will notto block access to the balcony. the door is open should not interfere with any pelmets above, no additional side of the veil, no frills at the bottom. It is also important to note that when you open the balcony door, the air from the stove will fly in the direction of curtains, which means that they must be made of durable, wear-resistant, washable materials. If the stove is located near the window - it is better to choose fire-resistant fabric. Roller blinds, which can be combined so, to close the window sill to steady, and the door - to the floor. 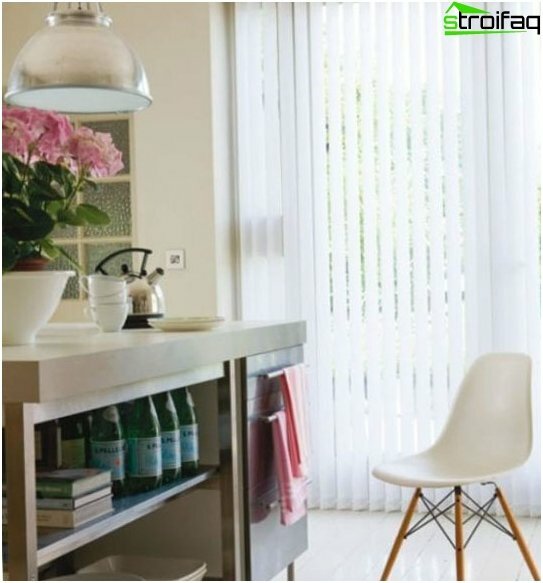 Vertical blinds - practical and fashionable - kitchen with balcony in a modern style. Combined curtains. For example, in the window can hang roman shades, and the balcony door closed "Japanese" panel. In their manufacture need to use a cloth to keep harmony composition. Pelmet perfectly merge window and door curtains, and in addition will mask the ledge and you arrange a balcony. True this pelmet should be high so as not to interfere with the free opening of the door. Designers are united in the opinion that the best solution fora kitchen, where the windows are eaten most of the space - leaving them without textile finishing, picking up a bright frame. Alternatively, allowed Roman blinds that are easy to remove for complete room coverage. 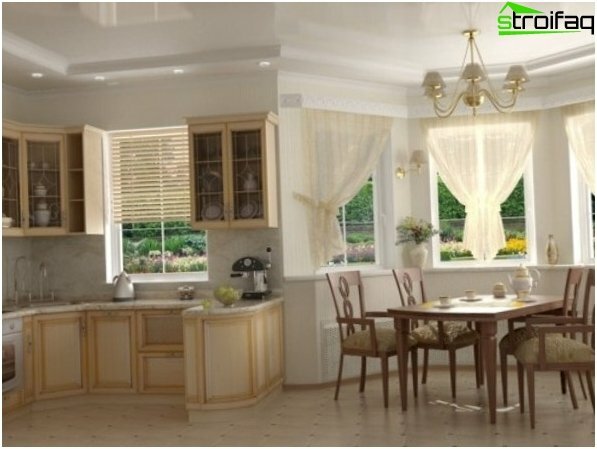 If the kitchen is spacious and there is no problem with the area - feel free to insert the windows large decorative curtains. Blinds. They are compact and easy to maintain, if necessary unwound easily in roll. Roman curtains. Elegant, easy to care for, combine minimalism and functionality. When lifting the bottom edge are easily assembled into beautiful undulating folds. The only drawback - the form of curtains can not completely open the windows. Pleated Blinds - a curtain of a specialpleated fabric, which is fixed on both sides in a single structure. They can be covered individually the upper or lower half of the window that helps to regulate the kitchen light. Easy to care for: easy fit vacuum cleaner to clean them. Transparent curtains, suspended on hinges, hooks, eyelets. If desired, it is also possible to add sun blinds on the window frame. It pelmet as a full-window decoration, or in combination with light-proof curtains or blinds. The significant disadvantage of the small room - quickly tired interior. An easy way to prevent this problem - regularly bring in kitchen Design diversity. Purchase a few curtains perodicheski options and change the model, depending on your mood or the time of year. Very popular recently beganstudios, where the kitchen and living room are combined in one room. In one part of the cook and the other a rest - it is worth emphasizing the difference with the help of textile window decorations. For example, the curtains in the living room can be ceremonial, and the kitchen - simple and practical. Professional decorators are advised to choose this tissue-companions from the collections sewn in the same color and style. 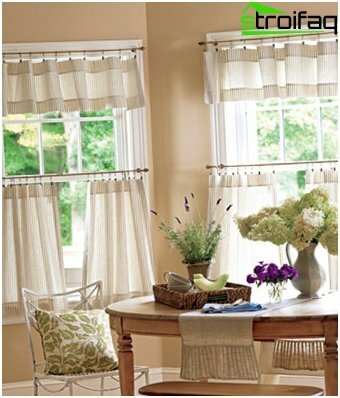 Add the fabric from the first window curtains to finish second - and you have a great composition. Pelmet - it's beautiful ruffles, specialfinish of the fabric, which serve as an ornament the cornice. This is perhaps the most beautiful of all decorative elements to decorate the window curtains solemnly, making it more expressive, and gives the entire interior a rich and luxurious feel. Choosing curtains with lambrequins, always considerthe size and shape of the window and make sure that they are successfully combined with the style of the room and the rest of the kitchen decor items. It is better to give preference to the tissues, which are simple in use, will not pile up on a lot of dust, dirt and absorb all the cooking odors. There are also special fireproof pelmets, which are impregnated with substances that prevent tissue inflammation. 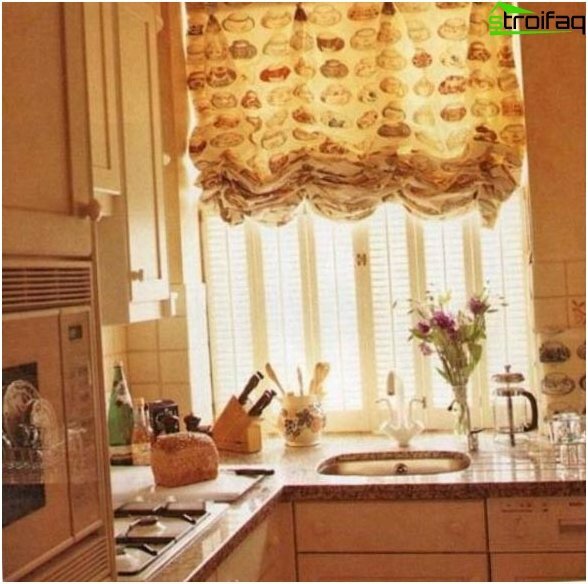 Short curtains in the kitchen, in addition to its main decorative features, have a huge number of advantages! This model allows you to use the extra space in the window. Short curtain curtained even in the form of not impede the free access to the window sill. 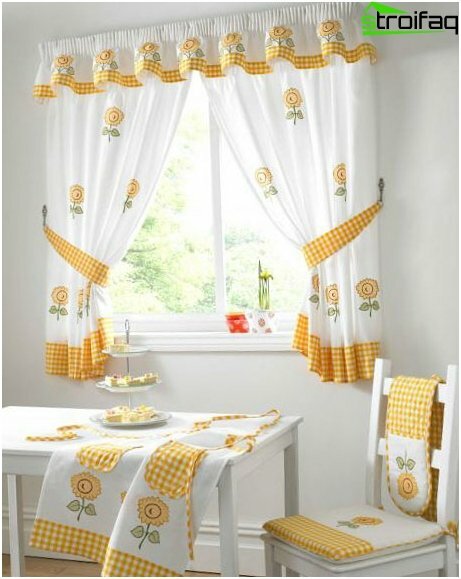 Ideal for the decoration of the window in the kitchen with a balcony. 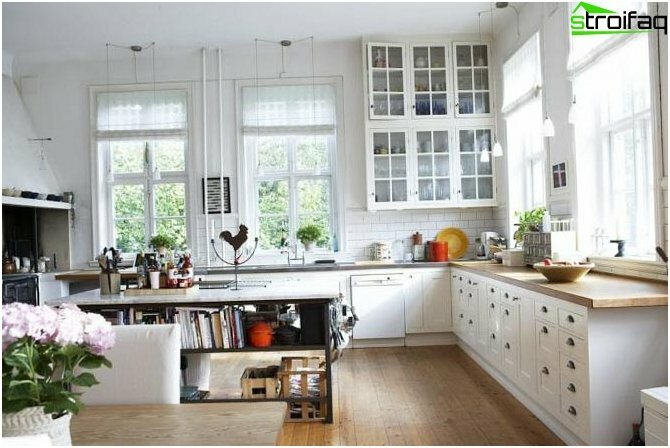 Visually make the kitchen spacious and airy, which is especially good for rooms with a small area. Serve bright color accent in the interior. If your "color experiment" fail - curtains can be replaced quickly and easily with new ones. Bright curtains short length perceived by the eye more comfortable than the same long. Easy to care for: short curtains easily removed, washed, dried, ironed and hung again. 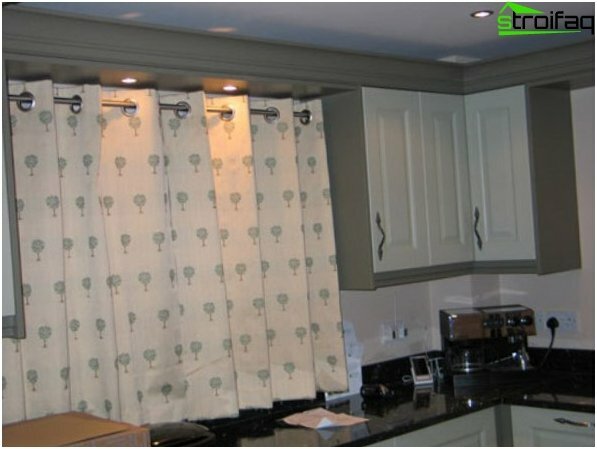 A wide range of design solutions for short curtain allows you to choose an option for the kitchen of any style. 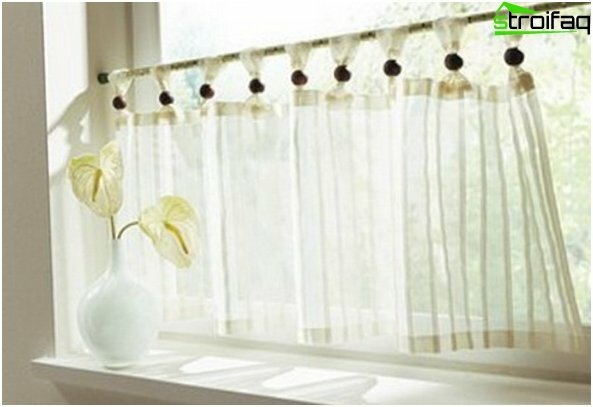 These curtains are usually are made oflight translucent fabrics. Their folds nice cascade down and heaving breath of wind, filling the space cuisine with freshness and cleanliness. Rings fairly simple structure, so all the attention goes to the fabric, which should be nice and original. 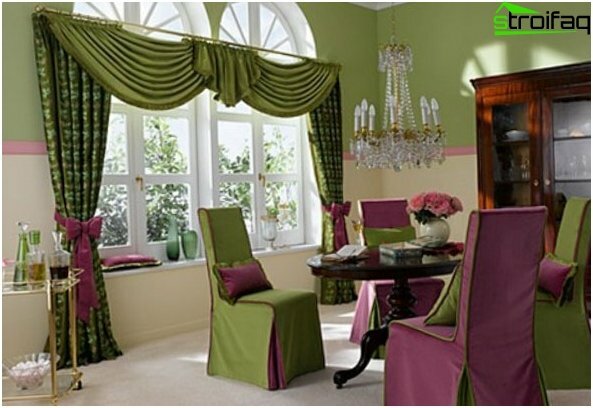 Therefore, in the manufacture of curtains, preference is given to expensive exclusive textiles. Kitchen curtains on rings look great ininteriors of all styles. Wooden rings are beautifully combined with kitchens in the country style and Provence, metal - suitable for modern and minimalist kitchens. For these curtains should choose not heavy fabrics,bay window to not look like a theater curtain. 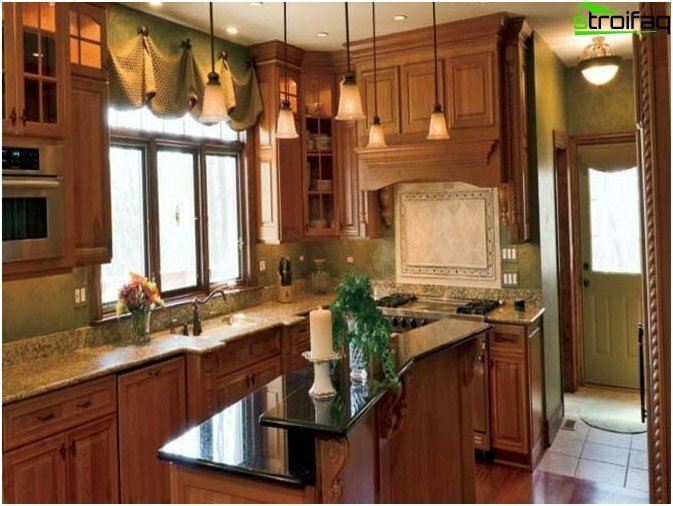 The large kitchen is actually a drape decoration. 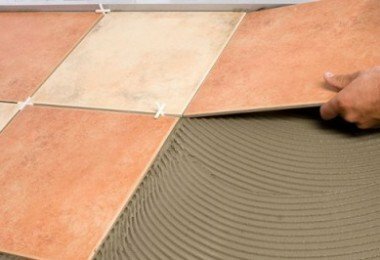 If competently to combine several different colors and textures - this will give the room more depth. 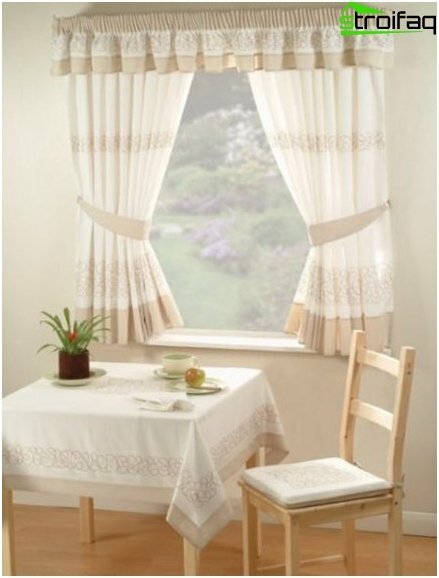 When decorating bay windows, choose short curtains up to the window sill, or standard roller, Roman, French curtains or blinds. Do not cover the whole area of ​​the window drapes, otherwise the room will remain light. 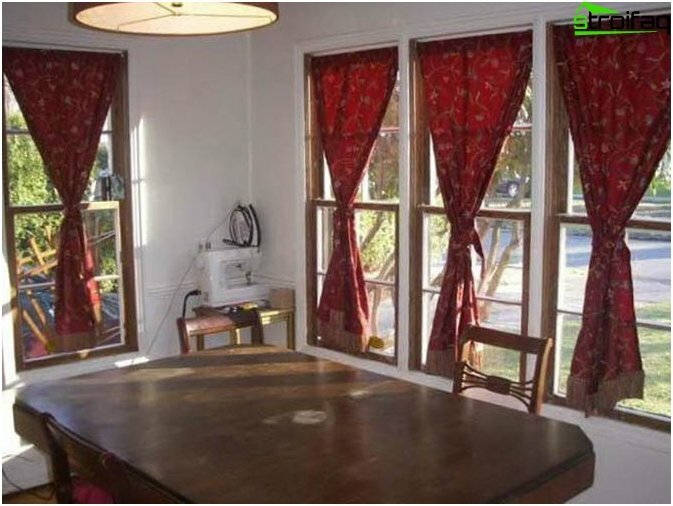 If your kitchen a few windows in the bay window, you should order a separate curtain for each window. But if the bay has a semicircular shape, there will be a large enough and curtains. The cloth. The heavier the fabric you choose - the more the size of the folds in the curtains. If you want big beautiful waves - safely buy heavy dense materials. But if you want transparency and lightness in the interior - you will approach tulle and nylon. Practicality. Say "no" to loose fabrics such as velor, velvet, tapestry bilateral. Length. In the small kitchen long curtains can only izoblegchennyh tissues. Traditionally, small kitchens to choose the length of the sill: they are beautiful and practical. If your room size allows to experiment - feel free to choose any length curtains, what you like. Combination. The classic combination - light tulle, and on top of the massive curtains. 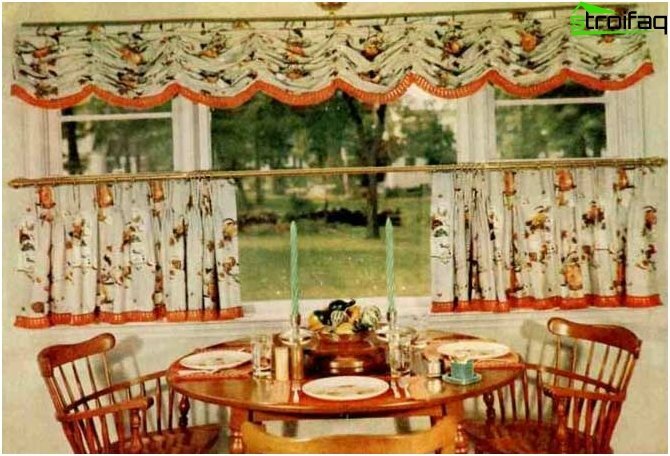 If you prefer a family tradition this combination, add eyelets on curtains Roman or roll, made of transparent fabric. So you save on your kitchen necessary level of illumination. For lovers of needlework is not difficultyourself you arrange the window in the kitchen, without the help of designers and decorators. If you have a sewing machine and a great desire to sew beautiful shade the desired model in the cellar. Measure the distance from the eave curtains down to the desired length. Add the 6 centimeters lower podvorot and 3 cm at the top hem. In sum, the length necessary to get fabric curtains. Measure the length of the cornice, and multiply by halfadd 4 cm hem on the sides. This will be the width of the fabric required for standard curtains. If you wish to make a drapery more expressive, multiply the length of the cornice 2. The next step - the purchase of cut fabric. For the manufacture of curtains fit tulle, organza and other synthetic materials, but preferably still choose natural materials such as linen and cotton. Some retail chains also offer interior textiles: the fabric made of natural fibers and impregnated with special dirt- and dust-repellent agents. They are resistant to fading, and do not crumple easily erased. 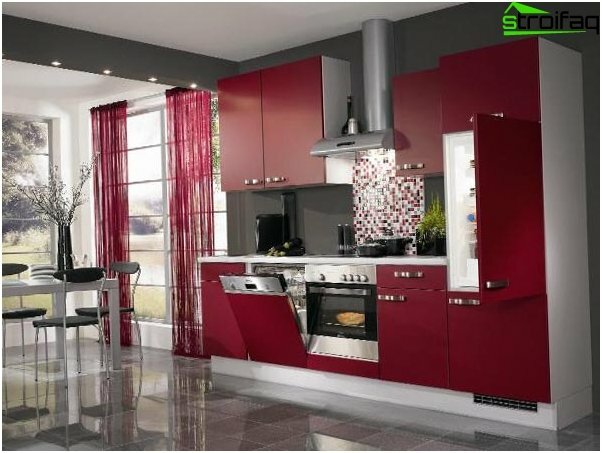 Choosing the coloring, remember that it must be in harmony in color and style of the kitchen design. The simplest pattern for curtains - one or tworectangle. If you or cotton blended fabric before cutting it is better to moisturize and properly ironed. Measure along the edge of the necessary length of the height of the curtains plus seam allowance. By cutting width pull out one or two lines that point to the cut line. Pull the string and tuck into the place to be. 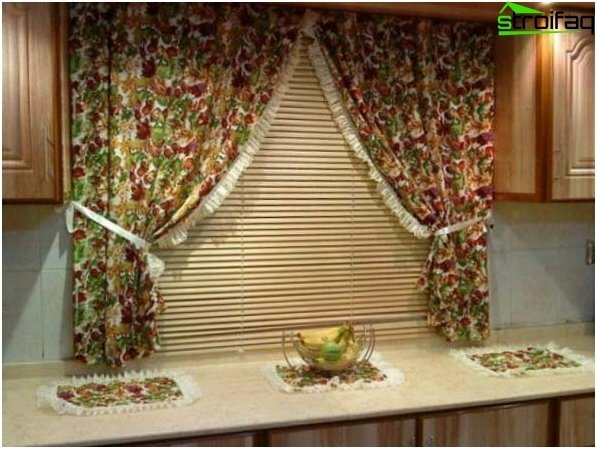 It is the ideal layout for a future curtains. The first step is to treat the upper edge of the machinecurtains: the upper bend allowance, baste it, and then stitched webbing for curtains. The length of the stitch is better to take from 4 to 6 mm. Tuck and also treat the side sections, in the process of hiding the inside edge of the curtain tape. Attention! Tucking edge tape, be sure to leave the accessible end of the cord! When the curtain is ready, pulling the strings, you can easily it is gathered to the desired width. The next step - turn in and treat the bottom of the curtains. Properly secure all the threads and to iron the finished product. New beautiful curtains fix on the ledge with special hooks.